Awarded for “Documentary Achievement” at the University of Toronto Film Festival, this film documents academia’s treatment of critical perspectives on 9/11 by examining impairments in professional inquiry, the usage of terms functioning as thought-stoppers in academic discourse, the epistemological implications of basing the official 9/11 narrative’s foundation on testimony obtained from torture, the non-response to critical scholarship on 9/11 in the humanities and sciences, and the attacks that had occurred on academic freedom. The documentary promotes a powerful reflection on intellectual courage and the purpose of academia, and aims to change intellectual discourse on 9/11 and the War on Terror for a more peaceful world. This documentary is produced by Zuberi Productions, a group that was founded for the purposes of advancing knowledge and learning. All proceeds go to the cost of the production. This documentary is not for profit. This production would not have been possible without the financial support of the University of Toronto’s Hart House Film Board. “9/11 in the Academic Community,” a Winner of the University of Toronto Film Festival, is a unique film that documents academia’s treatment of critical perspectives on 9/11 by exploring the taboo that shields the American government’s narrative from scholarly examination. Through a powerful reflection on intellectual courage and the purpose of academia, the film aims at changing intellectual discourse on 9/11 and the War on Terror. As well as probing the repercussions several scholars have endured due to their investigation of 9/11, this documentary provides an analysis of impairments in professional inquiry, ranging from the failure to critically reflect on terms functioning as thought-stoppers (such as “conspiracy theory”) to the structural approach that restricts inquiry to the broad implications of 9/11 while shutting out inquiry into the events of the day itself. As 9/11 served as the rationale for the Global War on Terror, the expansion of the military and intelligence complex, the invasion of other countries in violation of international law, and the curtailing of civil liberties, the film provides an inspiring demonstration of intellectual courage that will cause many scholars to reflect on the academy’s role and strength to dismantle the war system. 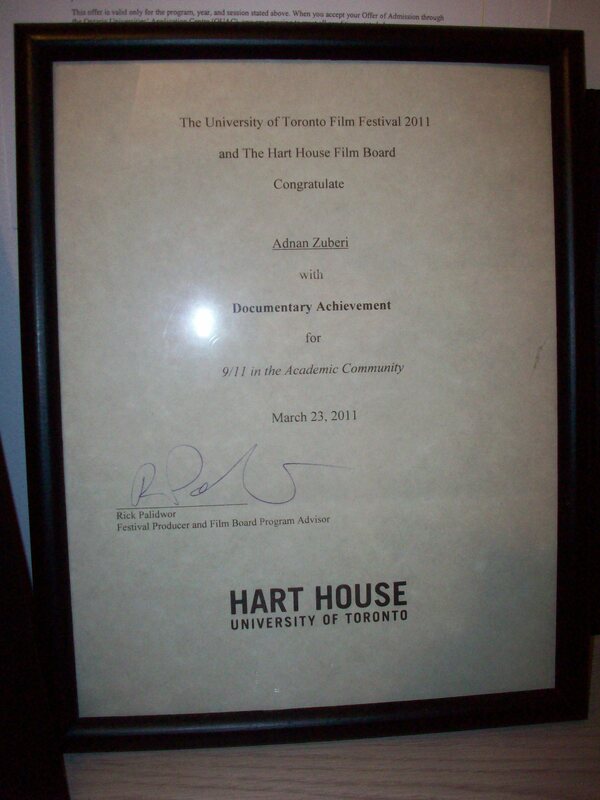 Adnan Zuberi has served as a member of the University of Toronto’s Hart House Film Board. He holds a Bachelor of Mathematics in Honours Mathematical Physics from the University of Waterloo. Mike Bondi received his BASc in Systems Design Engineering at the University of Waterloo. He is an engineering consultant since 2003 and has worked with a broad range of clients in various industries. Mike is a specialist in computer science & IT, electronics and computing hardware, RF and wireless, and manufacturing. Barry Shainbaum is an author and inspirational speaker, addressing diverse audiences that span mental and emotional health groups to high-end corporations. From Nelson Mandela and Jane Goodall to Arun Gandhi and Shimon Peres, Barry has traveled the world to photograph and interview the world’s most noted icons of hope and heroism, and he brings their empowering messages to the general public. Barry is also a radio broadcaster, hosting Perspectives, in Kitchener, London, Woodstock and Brantford. The following academics were interviewed for the documentary. Richard B. Lee is Distinguished Professor Emeritus of Anthropology at the University of Toronto. Internationally recognized for his ethnographic studies, he has held academic appointments at Harvard, Rutgers and Columbia University. He is a Fellow of the Royal Society of Canada, a Foreign Honorary Member of the American Academy of Arts and Sciences, and a Foreign Associate of the National Academy of Sciences. Dr. Lee has served as President of the Canadian Anthropology Society and holds honorary doctorates from the University of Alaska Faribanks and the University of Guelph. American Scientist holds one of Dr. Lee’s work to be amongst the 100 greatest scientific works of the 20th century. Walter G. Pitman has served as Dean of Arts and Science at Trent University, Director of the Ontario Institute for Studies in Education at the University of Toronto and President of Ryerson University. He has also served as Member of Provincial Parliament, Member of the Standing Committee on Education and University Affairs, Director of the Ontario Arts Council, Chair of the Ontario Association of Arts Education, and President of the Canadian Civil Liberties Association. He holds honourary degrees from McGill, York, Brock and Trent universities. He was awarded the Order of Ontario and was made Officer of the Order of Canada. John McMurtry is Professor Emeritus of Philosophy at the University of Guelph. A Fellow of the Royal Society of Canada and a President’s Distinguished Professor, his work has been published in more than 150 books and journals. McMurtry was selected by the United Nations as organizing author and editor of Philosophy and World Problems, which will be included in the Encyclopedia of Life Support Systems. He is also the author of Unequal Freedoms: The Global Market As An Ethical System (1998), The Cancer Stage of Capitalism (1999) and Value Wars: The Global Market Versus the Life Economy (2001). David MacGregor is Professor of Sociology and former Chair of the Department of Sociology at King’s College of the University of Western Ontario. He is the author of many well known books such as The Communist Ideal in Hegel and Marx (1984) and Hegel, Marx, and the English State (1996). Dr. MacGregor has been awarded the Porter Prize of the Canadian Sociology and Anthropology Association. Omar M. Ramahi is Professor of Electrical and Computer Engineering at the University of Waterloo and is cross-appointed with Mechanical and Mechatronics Engineering, Physics and Astronomy. He has authored and co-authored over 240 journal and conference papers and is a Fellow of the Institute of Electrical and Electronics Engineers (IEEE). Lynn Margulis (1938-2011) was a Distinguished University Professor in the Department of Geosciences at the University of Massachusetts, Amherst, and was awarded the National Medal of Science by President Bill Clinton. She was an elected fellow of the National Academy of Sciences, the World Academy of Art and Science, the Russian Academy of Natural Sciences and the American Academy of Arts and Sciences. Paul Zarembka is Professor of Economics at the State University of New York in Buffalo. He is Senior Editor for Research in Political Economy since 1977, editor of Frontiers in Econometrics, as well as editor of The Hidden History of 9-11-2001. His research interests include Economic Development, U.S. Labor History and Marxist Theory. Dr. Zarembka has appeared in various editions of Who’s Who in America, Economics, in Finance & Business and American Education. Robert M. Korol is Professor Emeritus of Civil Engineering at McMaster University. He is a Fellow of the Canadian Society of Civil Engineers and the Engineering Institute of Canada. His major research interests have been in structural mechanics and steel structures including the design and behaviour of tubular members acting as columns, beams and connections in bridge and building applications. Michael Truscello is an Assistant Professor of English and General Education at Mount Royal University. His fields of expertise include: Software Studies, Free and Open Source Software, Rhetoric of Science and Technology, Alternative Media, and Postanarchism. Graeme MacQueen is a retired Professor of Religious Studies at McMaster University and founding Director of McMaster’s Centre for Peace Studies. He has been the director of various peace building projects in war zones and is currently co-director of the project Media and Peace Education in Afghanistan funded by CIDA. He is a recipient of the Lifetime Achievement Award by the McMaster Student Union. Disclaimer: The personalities listed above are not representing or speaking on behalf of the institutions or associations they are affiliated with. Adnan Zuberi reminds us, academic freedom is also the responsibility of scholars to pursue the truth. but that of the whole world. I believe this documentary should be shown as widely as possible. Whatever else is done by the men and women who work in our universities, it is essential, I believe, that large numbers of them stand sufficiently outside society intellectually to see, understand, and interpret what is going on. I find it troubling that so few—there are credible exceptions—have seriously engaged with the question of what actually happened on 9/11 and why. There are so many holes and limitations in the official version that it calls out for rigorous intellectual fact-finding and analysis. in order to foster a wider, fact-based discussion among researchers and students alike. Canadian academic historian Michiel Horn has observed that as a rule, professors are milquetoasts. Here is documentary proof of Horn’s observation, on the subject of this century’s first great day of infamy. This film also documents exceptions to Horn’s rule: professors with guts enough to raise critical questions. Highly recommended, especially for provoking reasoned political discussion and debate. This documentary confronts the academy’s uncritical response to the defining event of our times. It is an essential viewing for everyone in academe. academics tend to deal with controversial issues. The main thesis of the film concerns the silence of the academic community on this vital issue. I think it is extremely important and very well produced. that academics are seekers of truth, but especially comfortable truth. state of discourse in the academy at large regarding the events of 9/11/2001. University audiences should find this important documentary humbling: 9/11 in the Academic Community offers an unsparing analysis of the timid refusal of most North American academics to engage critically with the events of 9/11, despite the glaring inadequacy of official accounts of what happened. But audiences may also draw encouragement from the film. The interviews provide examples from a wide range of disciplines–from engineering and econometrics to textual scholarship and philosophy–of researchers engaged in principled analysis of the evidence. The following articles are peer-reviewed journal papers that address issues surrounding the day of 9/11/2001 from a critical perspective. Academics are encouraged to take an interest in critical 9/11 research. Journal: Journal of Structures, Vol. 2014, Article ID 795257, 7 pages, 2014. doi:10.1155/2014/795257. Authors: Dr. Gregory Szuladzinski (PhD, Structural Mechanics), Tony Szamboti (ME), and Richard Johns. June 2011 | Was There Abnormal Trading in the S&P 500 Index Options Prior to the September 11 Attacks? Fall 2010 | Is Infiltration of ‘Extremists Groups’ Justified? Note: This is not a peer-reviewed paper. It is an analysis that was submitted to the NIST during the public comments period by two of Australia’s top researchers in fire engineering. Their analysis refutes NIST’s WTC 7 Report. NIST has yet not responded to their questions. Journal: Journal of the Utah Academy of Sciences, Arts and Letters, 83:252, 2006.